The Purobio Vegan Mattifying Complexion Base mattifies and uniformises oily skin before applying make-up! Creamy texture, the combination of organic silica, organic jojoba oil and tocopherol helps absorb excess sebum. Thanks to its ultra-softening and opacifying action, it dries quickly for an immediate application of your foundation. With Purobio Organic Anti-Shine Base, your complexion is smooth, sublimated and unified! Purobio Mattifying Base for Oily Skin improves the hold of your make-up! Apply a small amount of oily skin base to the T-zone of the face (forehead, nose and chin) with your fingers and spread evenly until completely absorbed. Don't take too large an amount to avoid excessive drying of the skin. Don't apply around the eyes, this delicate area requiring specific products. For combination skin, it is recommended to apply the dry skin base to dry areas of the face. 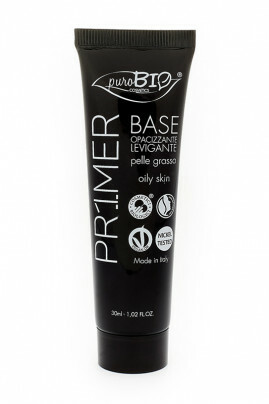 PUROBIO Vegan Base for Oily Skin takes care of your skin!